The question of whether the four categories of Fellowship, professional recognition from the Higher Education Academy (AdvanceHE), represent a progression framework appears to be one of those perennial discussions. At first glance, it is understandable that it might be interpreted as though individuals must first achieve a D1 (descriptor1) 'level' before moving on the D2 and so on. The truth is slightly more confusing. I believe we should all we use carefully chosen language in identifying the differences between categories of Fellowship by avoiding the implication of levels in D1, D2.... and instead have an active discussion with Faculty about the descriptors and potential labels. In my practice, I insist on discussing the differences between a Teaching Fellowship (D1) and an Academic Fellowship (D2), between that and a Leadership Fellowship (D2) and a Strategic Fellowship (D4). I believe an accurate interpretation of the UKPSF and its relationship to Fellowship Descriptors across all four categories make it largely incompatible with any institutional promotional structure. Certainly achieving recognition within a category can, and should, generate evidence that can be used as part of an evidence base towards promotion, but tying Fellowship to internal promotion distorts individuals understanding of Fellowship and undermines their active engagement with the Professional Standards Framework. I do not represent either an authority on the UKPSF nor do I represent the views of the HEA or AdvanceHE. These are my personal views based on having overseen an institutional scheme and written an aligned PGCert, as well as providing some consulting services to a number of UK colleagues in recent years. Other than my publicly stated reservations about the lack of an epistemological referencing within the UKPSF I think it is an essential tool for reflective practice. Everyone is busy! I suspect we need to do a better job of supporting new Faculty to develop a reflective portfolio from their first day on the job. It should be part of that first on-boarding conversation with their new line manager. Encouraging new staff to document even the most mundane professional observations is necessary but is rarely a skill most of have naturally. This segment makes a few suggestions. The Fellowships have four descriptors, one each, obviously. Of course, they are numbered 1 through 4, D1, D2.... So it is natural enough to assume that they are progressive, that they constitute a series of levels. This is not the case. Each descriptor describes the kind of role that someone in HE has and articulates this with reference to the UKPSF. Even if you are an extremely competent academic, engaged in all dimensions of the UKPSF with evidence of your on-going excellence in practice, you cannot assume to be made a Senior Fellow without exploring your practice against this new category's descriptor, essentially the leadership and mentoring of others around learning and teaching. It is important to grasp the notion that longevity and 'excellent in role' is not sufficient to presume eligibility. In each category, there is a distinct focus. This segment explores the four distinct categories as teaching, academic, leadership and strategic roles. I think this makes it easier to unpack them. The Higher Education Academy (AdvanceHE) have not detailed any guidelines for what constitutes 'remaining in good standing' as a Fellow, in whichever category it is awarded. But, institutions are encouraged to support Fellows to document their practice and facilitate both reflection and sharing. In theory, an institution's delegated authority to award fellowships through an accredited pathway could be at risk if the HEA chose to audit an institution and found them wanting. It need not be that difficult. Here are a few suggestions. Not everything that engages students is directly assessed but everything they are asked to do should be justifiable as informing the assessment and ILOs. How closely mapped are the ILOs to each topic, week or session outline? How confident are you that you cover the ILOs appropriately in terms of weighting and importance? 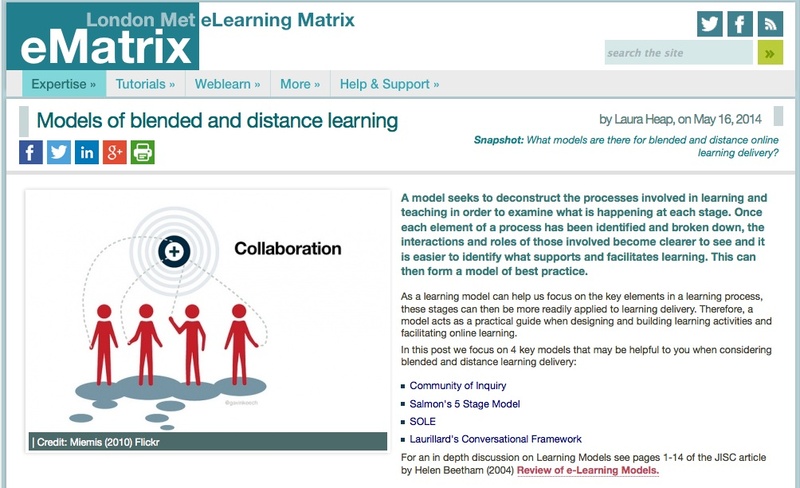 How much variation is there in the learning approaches taken throughout your module? How are you enabling students to develop skills beyond knowledge acquisition? See 8-SLDF pages for a fuller explanation. I've been looking recently at a range of new builds in Universities and colleges in the UK and have been struck by the relative lack of any learning theory behind the designs. Beyond, that is, the Vice-Chancellor's evident pride at being able to point to the new coffee franchise and padded benches and say wisely "students' like to learn in these informal spaces you know". Today, ahead of some planned workshops in July, I published a short working paper entitled “Re-visioning Learning Spaces: Evolving faculty roles and emerging learning spaces“. The paper recognises that new build and refurbishments of educational spaces can be significant financial commitments and often represent ‘flagship’ investments for many universities. It questions whether they are really supporting effective learning. This paper advocates that truly effective spaces need to be more closely associated with the particular learning contexts one is seeking to enrich. Re-visioning our learning spaces requires universities to create and engage with a conceptual model of the learner and faculty, to develop not just new spaces but support for new roles within those spaces. The SOLE model is presented as a conceptual framework through which new spaces and new faculty roles are considered. 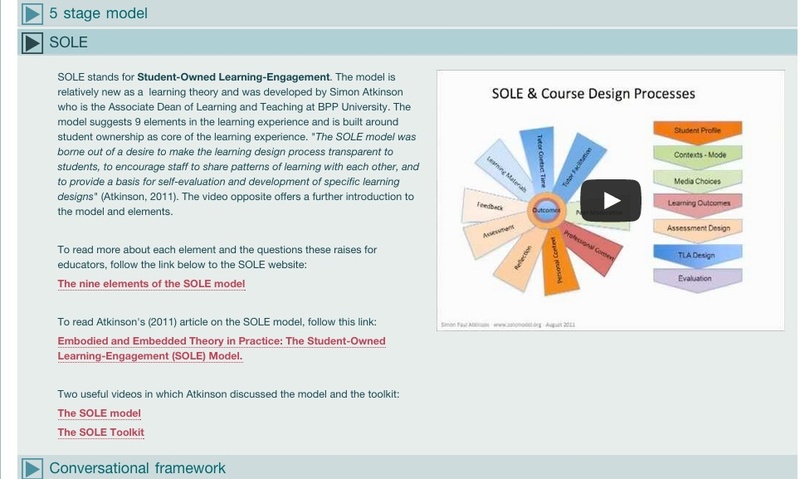 Following the presentation of the SOLE model and toolkit at Madison-Wisconsin in August 2011, a number of conversations about the ‘diagnostic’ function of the SOLE toolkit have taken place. One of the concerns of faculty and students is contact time. How much contact time am I being offered (versus how much I take advantage of), what other opportunities for facilitated guidance do I have. Why indeed, do I as the student not recognise the ‘directed’ learning I have been pointed to, and in the case of the SOLE approach, the entire toolkit forms an advanced organiser that demonstrates the consideration faculty have given to my learning time as a student. The version of the Toolkit presented at the 27th Distance Education Conference at Madison Wisconsin broke down the learning engagements students were being asked to complete under the 9 elements of the model into 5 areas, or modes, of engagement. These are exploring the notions of learning engagement as reflective, introspective, social, facilitated and directed. In the next version of the toolkit I’m exploring a ‘dashboard’. The Dashboard is a separate sheet that simply presents an overview, to faculty and potentially students, of the modes of learning being designed for the student. It shows at a glance, alongside the full profile of activities for each week or unit, a schematic that illustrates how much of the activity is facilitated, directed, and so on. Great afternoon session today at Madison Wisconsin Conference. Some 50-60 people, the majority were faculty, and the majority with some responsibility for learning designs. It was an opportunity to outline the model and explore the cultural and contextual factors that lie behind the conceptual model. Some good exchanges and lots to think about. The toolkit was then demonstrated and seemed broadly appreciated. At least two people downloaded the free Excel Workbook during the session and hopefully more will do so shortly. It would be wonderful to find a US institution that felt the SOLE model could support their instructional design teams and faculty to develop more effective holistic learning design for learners. I had two posters at the conference, a solo effort with the SOLE model and a joint effort with Kevin Burden from the University of Hull featuring the DiAL-e framework work we have been doing since 2006. There was an excellent response to the SOLE poster and considerable interest in its potential use as a staff development stimulus. I was particularly keen to suggest it form a useful tool for course team development in the broader context of course design, but every conversation helps me refine my own ideas, which is after all why we go to these conferences!